I just laughed to tears after I watched over this video.😂 Jianye Dai, perhaps one of the oldest rock star at TikTok, gave the most humorous and informative interpretations about Li Po, Tu Fu, and Tao Yuan Ming. You just cannot miss this, man! If by life you were deceived, don’t be dismal, don’t be wild! Access these GitHub repositories, they will make your day definitely! I almost missed, and never missed Michael Laudrup. 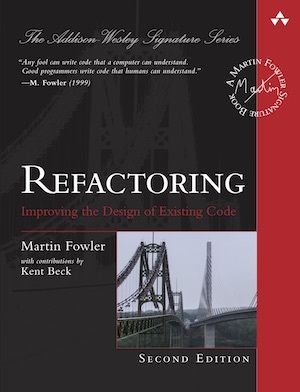 However, I never missed “Refactoring: Improving the Design of Existing Code” by Martin Fowler from the beginning. I read this book in 2009 for the first time. It significantly shaped my coding habit, which also made me promoted as the team leader in less than one year - I will tell you why later. After nearly 20 years this book was revised, enhanced and released to 2nd edition. Trust me, you SHALL NEVER miss this masterpiece. Symbols count in article: 5k | Reading time ≈ 5 mins. Yes, you can write short, clean Java code following 7 tips introduced in this article. Some of them might make you surprised, but trust me, they are proved practices - at least by me. YNOT and Zorro Opensourced Today! Just spent some time to open source two personal projects I built at SAP 4 years ago: YNOT and Zorro. They had never been used in a production environment, but I cannot forget them and those sleepless nights. As a programmer not talented, stick to and resolve some problems painful both to me and my teammates, is the greatest motivation driving me coding - and I enjoy it much. Symbols count in article: 2.3k | Reading time ≈ 2 mins. Symbols count in article: 3.6k | Reading time ≈ 3 mins. I will always remember that cold night on Sep 15, 2001. China beat Uzbekistan 2:0 at Shenyang Wulihe Stadium in the last match. Qualified for World Cup 2002 finally - the first time and possibly the last time. Today I want to introduce a coding beast Haseeb Qureshi and how you can crack coding interviews like him. Symbols count in article: 4.2k | Reading time ≈ 4 mins. I became a soccer fan in 1998. My elder brother just kept preaching to me and tried to convert me shamelessly - he succeeded, finally. My first impression of Michael Laudrup at World Cup 98, is his magical pass to Sand in 1/8 Final between Denmark and Nigeria. Even TheTechLead Himself Cannot Design A Good Logo! Symbols count in article: 1.2k | Reading time ≈ 1 mins.